Lt. Gen. Raymond A. Wheeler, veteran of more than three years' service in the Far East and three times awarded the Distinguished Service Medal, will shortly assume command of the India-Burma Theater when Lt. Gen. Dan I. Sultan leaves for Washington, D.C. for an important undisclosed assignment in the United States. An I-B Headquarters news release announced that Wheeler, Deputy Supreme Commander and Principal Administrative Officer of South East Asia Command, will continue to hold his SEAC assignments, in addition to his new command. Handsome, 59-year-old Wheeler, native of Peoria, Ill., commanded SOS in the formative days of the CBI Theater, from March, 1942, to November, 1943, when he became Principal Administrative Officer of the then newly-formed South East Asia Command. Wheeler was appointed Deputy Supreme Commander under Supremo Lord Louis Mountbatten a year later, in November, 1944, when Lt. Gen. A. C. Wedemeyer was selected to command the new China Theater which resulted from the split of the CBI Theater. The new I-B Theater commander was graduated from West Point in 1911 with a commission in the Corps of Engineers. As regimental commander of the 4th Engineers in France during World War I with the temporary rank of colonel, Wheeler was awarded his first DSM for his work in the Aisne-Marne, St. Mihel and Meuse-Argonne offensives. After the war, he was an instructor at Fort Benning's Infantry School from April, 1920, until July, 1922. Then came a four year tour as Assistant Engineer Commissioner of the District of Columbia, followed by attendance at the Command and General Staff School. In June, 1927, as a major, Wheeler became assistant engineer of maintenance for the Panama Canal. From April, 1930, until August, 1936 he served as district engineer at Wilmington, N.C., and later at Rock Island, Ill. After graduation from the Army War College in 1937, he became resident member of the Board of Engineers, Washington, D.C. In September, 1941, he was promoted to brigadier general and assigned to the office of the Chief of Staff in Washington. He became acting Assistant Chief of Staff, Supply Division, G-4, on the General Staff. Late in 1941, he was assigned to the Army Group, Washington, D.C., and went overseas with a military mission charged with developing a supply line to Russia through the Persian Gulf. He was subsequently promoted to major general and assigned as Commanding General, SOS, in CBI. After his transfer to SEAC, Wheeler received his first Oak Leaf Cluster to the DSM for his organization, direction and supervision of supply and maintenance activities in CBI. He was promoted to lieutenant general, Feb. 21, 1944. Wheeler was recently awarded the second Oak Leaf Cluster to the DSM for his services as Deputy Commander, SEAC. Gen. Dan In Burma Lt. Gen. Dan I. Sultan took an active part in the reclaiming of North Burma from the Japs. Here, Gen. Dan, right, is shown near the front conferring with Maj. Gen. Liao Yao-hsiang, commander of the Chinese Sixth Army. When Dan I. Sultan, then a major general, arrived in the CBI Theater a year and a half ago, the Allied campaign that was to culminate this spring in the recapture of North Burma was stirring into life, although it had not yet been officially announced. Sultan was appointed Deputy Theater Commander to Lt. Gen. Joseph W. Stilwell during that early January, 1944; and to 37 years Army experience seldom paralleled in their uniqueness he proceeded to add 18 months of other singular adventures. But until his appointment as Commanding General of the new India-Burma Theater in October, 1944, Sultan's activities in the Far East were cloaked in anonymity. "Uncle Joe" Stilwell was the brilliant quarterback who grabbed the headlines. Sultan, promoted to lieutenant general in September, was the steady, unspectacular blocking back whose solid efforts, though appreciated by his team mates, seldom were rewarded by publicity. When staff officers complimented General Dan, Stilwell grinned, snapped "You're goddamned right!" Now Sultan was elected the quarterback. Handed the ball, he faced a multiplicity of tasks calling for astute field generalship. Among these were the securing of the land route from India to China, completion of the construction of the Stilwell Highway and the Pipeline, the capture of Lashio at Burma's waist, and the swelling of the trickle of supplies to the blockaded Chinese over the Stilwell Highway and the fabulous Hump. These were tricky obstacles, but they and others were hurdled by General Dan and the men and officers of the India-Burma Theater, working together, shoulder to shoulder, at the end of a low priority supply line under conditions, which, to state it mildly, were and are far from ideal. Like Stilwell before him, General Dan respected and admired the GI's of his command. In North Burma, he trod the same jungle trails, shared their hardships and participated in their campaigns. Yet he also popped up, from time to time, in Delhi, Chungking and Ceylon in his special plane, General Dan's Magic Carpet, for important meetings on broad matters of strategy and policy. 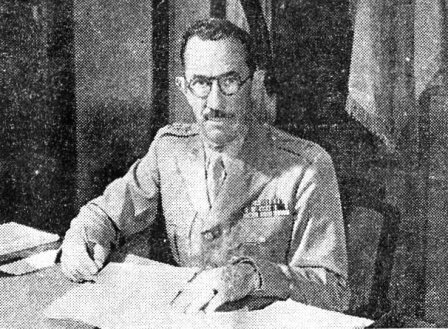 Sultan's military record encompasses command of combat troops from platoon to corps (Eighth Corps in Texas, immediately prior to his assignment in CBI); participation in World War I; commissionership of Washington, D.C.; command of troops in Nicaragua, 1929-31, making a survey of the Inter-Oceanic Canal Route; acting as assistant to Harry Hopkins in charge of the Civil Works Administration in sprawling Cook County, Ill.; coaching the West Point football team (outstanding pupils: Eisenhower and Bradley) and arranging the first Army-Notre Dame game. In the course of his career, he has been one of the few to be twice awarded the Distinguished Service Medal. NEW YORK - (ANS) - One hundred Stilwell Road veterans arrived here this week on a transport loaded with hundreds of men from India-Burma and China and, while ships' whistles tooted and bands blared, declared, "We've come from the Forgotten Land." Deeply tanned from the sun, the home-coming veterans cheered lustily as the ship passed the Statue of Liberty on its way to Staten Island. One veteran, who had experienced two monsoon seasons in the jungles of Assam and Burma, grinned and told reporters, "Brother, there was a time when I thought I'd never get the taste of Spam and corned willy and dehydrated potatoes out of my system. But we've been eating steaks, chickens, bacon and eggs all the way home and now that damned jungle diet seems a bad dream." Another soldier, his face still bearing saffron tinges resulting from daily doses of atabrine during long months in the jungle, watched the cheering crowd and said, "I've waited a hell of a long time for this moment." Fighting in South China this week quickened to an ever-heightening crescendo of attacks and counterattacks when, by week's end, had the armchair general's groggy and on the ropes. Ishan, major Jap base on the ancient Kwangsi Province trade route, was invested by the Chinese on June 10, but was recaptured by a strong Jap counter-thrust the following day. By Friday, however, Chungking reported that the Chinese had regrouped and launched an attack from the west that drove the Japs from the rubble of Ishan and sent them reeling down the railroad toward Liuchow 40 miles to the east. Chinese communiqu�s indicated that fighting in the former American air base city of Liuchow was still bitter, with troops engaging in hand-to-hand and house-to-house fighting in the city's streets. Meanwhile, other Chinese columns by-passed Liuchow in a drive on Kweilin, capital city of Kwangsi, 90 miles to the northeast. Early in the week strong Jap counter-attacks by garrison troops of the recently shattered southern forces of Nippon's Korea supply corridor drove the Chinese from the Indo-China border town of Chungching Fu. The Chinese Southern Army, however, was reported fanning out from a 160-mile stretch of the Korean corridor, capturing more towns near the border of Indo-China and driving eastward toward the great China seaport of Canton. Farther east, another Chinese column retook Tengyun, 25 miles west of the former treaty port of Wuchow and 165 miles due west of Canton. Chinese troops continued their drive north along the China coast and, by Monday, Chungking reported the capture of the walled treaty port of Wenchow in Chekiang Province, 220 miles south of Shanghai. Wenchow is the second large seaport retaken by the Chinese since they launched their comeback campaign along the China coast after the fall of the port of Foochow 25 days ago. More than 160 miles of China coast line have now been cleared, Chungking pointed out. Some India-stationed GI's are beginning to wonder just how much the folks back home know of Army affairs and geographical locations, judging by the multitude of humorous (but serious) questions asked daily through the mails. As example, one soldier's sister asked, "How large is the city of Assam?" Another requested information as to whether Bombay was located in the mountains of Tibet or near the India-China border! Not to be overdone by a GI's enthusiastic report on the people of India, one relative wrote: "Moslems are Hindus who believer in the god Buddha . . . isn't that right?" The endless chain of rhetorical questions include: "Have all the Germans surrendered in India yet or are they still fighting over there?" "You always ask for canned foodstuffs. Doesn't the Army furnish you food overseas?" "Frances and George are to be married next month. Do you think your commanding officer will let you come home for the wedding? Try to arrive early, please." The gem of all gems, was this extraordinary request: "I understand you can buy diamonds, rubies, sapphires and other precious stones in India very cheap. Enclosed is $1.00 with which I'd like for you to buy me a couple of good rubies. Don't let them pass off any junk on you; be sure the stones are perfect!" A few G.I. 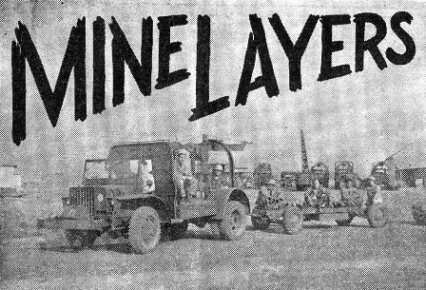 's take a lift on a naval light mine carrier to ride out to the revetments to pick up another load of mines to use against Jap shipping. The teamwork and unity of the United States Air and Ground Forces with the Naval and Marine Forces in amphibious and land operations has been one of the most widely propagated factors in the success of our major victories. However, while the actions in which landing craft operated by Coast Guardsmen, carrying Army infantry, and protected by the thunder of Army planes and Navy big guns have been universally commented on and highly lauded, other and equally lauded, other and equally important phases of this co-operation have gone on completely unknown and unheralded. For instance, in the India-Burma Air Service Command. The Navy and the Army have long been working together secretly in a co-operative program which has brought plenty of headaches to the Japs. That program is the laying of aerial mines. It might be well to explain what an "aerial mine" is, since the term is somewhat misleading. Briefly, it is an underwater mine used for shipping interference, but instead of the mine fields being laid by surface craft, aerial mines are dropped from aircraft. This system has many obvious advantages, being more rapid, offering practically an unlimited range of operations, and permitting repeated reinforcement of mined areas without hazard to the dropping craft from previously laid mines. At an Air Service Command Base in India for almost a year a small group of Army and Navy officers and Army enlisted men have been storing, servicing, modifying and shipping out to tactical units, the aerial mines which have done so much toward making the Japanese sea lanes and river arteries virtually impassable. The comparatively small detachment has supplied and serviced the mines used by the 14th Air Force, the 20th Bomber Command, the Royal Air Force and the Strategic Air Force in countless sorties against enemy supply lines. Its men have personally accompanied the sleek bombers on many missions which have resulted in the tightening of the Japanese forces' increasingly difficult supply problems. The primary assignment of this joint Army-Navy detachment is to receive, maintain and handle all aerial mines in the India-Burma Theater of Operations until their actual use in raids. The mines are normally shipped to the base by rail, unloaded and temporarily stored in protective revetments until forwarding orders or modification plans arrive. The mines are then taken to the workshops for checking and changed if necessary. After a rigorous inspection, they are prepared for shipment. When the mines are shipped out for tactical use they are accompanied by a picked group of men under the supervision of an Army or Navy officer. At advance bases these men supervise the loading and very often accompany the planes on the missions. From beginning to end, the work is both dangerous and difficult, but its importance in the progress of the war in the Far East cannot be overemphasized. The present detachment, activated a little more than a year ago under the command of Captain Norman C. Warner of Clinton, Iowa, had their hands full from the very start. They had insufficient equipment, material and personnel. The men built most of the necessary items in their own workshops and through trial and error established their routine of work. 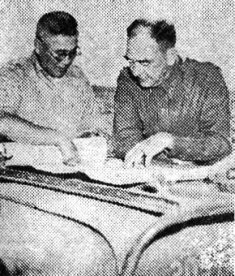 Since the mines are of naval design and construction, they had to depend on the Navy for all maintenance equipment - and along with the naval supplies came Navy officers, under Lt. Robert J. Munchausen of Shelby, Ohio, who have acted in the capacity of Technical Representatives. Munchausen and Lt. (j.g.) W. T. Beatson, a Virginian from Arlington, are mine experts who have to keep up with the latest modifications in mines and see that such changes are carried out. The role of the Naval officers is especially important because the bulk of the equipment, including a mobile machine shop, cranes, mine cradles and the necessary tools are still Navy property. Working along with Munchausen and Beatson, but stationed permanently off base, are Lt. N. D. Blair, Of St. Louis and Ensign Marshall A. Pease, Arlington, Va. In addition, at some of the advanced bases, naval seamen increase the note of incongruity by rolling busily from mine to mine. Other Army officers working under Warner are Lt. William J. Hanigan of Springfield, Mass., and Lt. Albert R. Smith, of Greenwood, la. These men, besides being Army Ordnance experts, have attended Navy schools where they studied the maintenance and servicing of aerial mines. The head enlisted man of the detachment is T/Sgt. Clifford S. Howard from Mexico, Mo., who sees to it that the complicated functions of the outfit move along smoothly. Under him work the aerial mine technicians, who all have gone to Naval Aerial Mine schools. Howard is the man who sends out Sgt. Merdia Watts of Pippapass, Ky., Cpl. Ermont H. Goldsmith of Newburyport, Mass., or Pfc. Richard A. Shoeman, a Brooklyn lad, to unload the freight cars of mines which come in regularly, classify them according to type, and place them in camouflaged revetments. Upon receipt of the shipping or modification orders, the mines are taken to the shop for testing and servicing by technicians like S/Sgt. Gordon Allison of Estill Springs, Tenn., S/Sgt. Buford Camp of Nashville or Pfc. Tom L. Doby from down Mandeville, La., way. With spare parts still difficult to obtain, Cpl. Clyde W. Parker of Omaha, Nebraska, will turn out any needed replacement mechanisms in the machine shop. The unenviable assignment of disposing of unserviceable or defective mines is one of the duties of S/Sgt. Richard K. Lee of North Warren, Pa., Sgt. John J. Guerro, Roseville, Ill. and Cpl. Larry L. Davis of Downey, Cal. The rocking explosions of these disposals can be heard for miles and the deadly mines give warning of their power by the tremendous scars they tear in the earth. Whenever orders come in for the delivery of mines to an advance base for tactical use, they are generally shipped out by rail accompanied by some men from the detachment, such as S/Sgt. Lewis E. Perdue of Copper Hill, Va., M/Sgt. William J. Hughey of Logar, Utah, and Cpl. Maurice E. Gillet of Orange, Texas; or perhaps Sgt. Edward G. James, a native of Turlock, Cal., Cpl. William Hunter of St. Louis, Mo., Pfc. Robert C. Marsh of Johnstown, Pa. At the advance base, the mines are checked once more, and after loading they are given a final going over. Most of the technicians of the detachment had little actual experience in the handling of aerial mines before coming to the India-Burma Theater, but many are real veterans of the Army. Sgt. Milton Hinman, for instance, has a record of 23 years service and was awarded the Bronze Star Medal in Alaska, as was Sgt. Fred H. Knott of Atlanta, Ga. A few of the original personnel have already returned to the States on furloughs and will be taking a refresher course at a naval school while there. The detachment has its own fleet of vehicles on which Cpl. Edward C. Molinari of Wallingford, Conn., is responsible for the upkeep. A Pittsburg, Kansas boy, Sgt. Earl G. Hammick, does most of the required carpenter work, while another Pittsburgh lad, but this time from Pennsylvania, Pfc. Milton Wintrob, and S/Sgt. Eddie J. Jackson, Fairbanks, Texas, take care of the many records which must be kept. The job this Army-Navy detachment is doing is important, dangerous and unpublicized. Stupendous! Colossal the tonnage is great. So shout the Generals of Five-Star rank. More tonnage, more tonnage they scream and they rant. "My God man didn't I tell you the T/O is closed." From day until night hunts this poor Pfc. "More tonnage, more tonnage, you're on flight don't you see! If you don't get on the ball, I'll lose my stripes, Holy Gee! Somewhere, somehow, this T/O stinks. After a weary flight "well done." An aproned Staff pours a measly shot of rum. All day long just sits on his rump. From the General a note so you won't be dismayed. "You're Colossal, Terrific, the tonnage is great! But as for a Rating, T/S, you're too late!" HEADQUARTERS, WEST CHINA RAIDERS - Col. Oliver G. Cellini stared through the rain-spattered window at a wet and bedraggled procession of Chinese who were trudging slowly but determinedly toward the exotic building in which his group headquarters was located. Life at this forward fighter base in Old China, which was six miles from the nearest Chinese town, afforded few diversions from the daily grind of working and fighting, and the Colonel welcomed this unexpected visit. He donned his slicker and stepped outside. As he stood in the rain before the crowd of some 50 men, women and children who had stopped before his door, he patiently waited to hear whatever complaint they were bringing to him. The next moment Cellini found his arms filled with huge bouquets of flowers. While he stood in amazement, the grinning crowd surrounded him with other gifts - four boxes of Chinese pastries, four chickens, several bottles of good rice wine and a basket of eggs (a precious commodity in China). Last, they thrust into his hand an envelope addressed to him and written in Chinese. TRY ON FOR SIZE "Go and try this on for size," kids PFC. Kenneth Yeaman of 95 Rosewood Ave., Washington, Pa., to this little Indian coolie who wears only a dhoti. 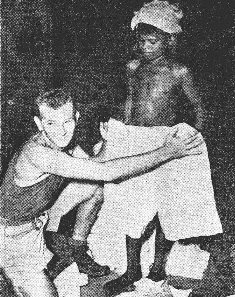 Yeaman helps supervise the stocking and shipping of thousands of tons of clothing for American soldiers in the India-Burma and China theaters at a warehouse of the Base General Depot in Calcutta. these people had walked the whole distance from town in pouring rain to bring gifts for their "good friend," Capt. Thomas D. Harrison, of Clovis, N.M. Harrison had crash-landed after a miraculous 140-mile flight from Japanese territory in his badly damaged Thunderbolt fighter. Brought into the town by residents who had seen the crash and rushed to his assistance, he had been given first aid by a Chinese doctor while a messenger was sent to the airfield to notify the Americans. Harrison liked the townsmen and they liked him. After he was returned to the field to be evacuated to a hospital in the rear, he sent the magistrate of the city a grateful note of appreciation. The crowd was disappointed to hear that their "good friend" was no longer there, but they were reassured by the Colonel's promise that their gifts would be flown to him at the hospital and that Harrison would come back again as soon as he had recovered from his injuries. Calling his interpreter, Cellini had him translate the note which accompanied the gifts. It was a letter written by the local magistrate for the people of the town, expressing their appreciation for Harrison's friendship and for his courage in fighting for China against the Japanese invaders. The Colonel was almost tearful when he called for candy to hand out to the children and a truck to take the soaked Chinese townsmen back to their homes. NORTH BURMA - Two Bronze Star medals and a pennant from Lt. Gen. Li-Jen Sun, commander of the Chinese First Army, were presented to men of the 48th Evacuation Hospital here recently at a ceremonial retreat formation. The medals were awarded to Capt. Max M. Goldberg and Lt. Earl R. Larson for exceptional service during the Burma campaign in 1944. The pennant was an expression of gratitude from the Chinese to the hospital staff for the medical care and attention that saved Chinese lives during the Burma campaign. Serving as a battalion surgeon, Goldberg saw service in action from May 28 to Aug. 3. During that period, the citation read, he worked unfailingly in performing his duties to the wounded men. On the night of June 15, he administered first aid and performed minor operations on over 35 wounded men by flashlight in a dugout dispensary. On several occasions he worked under enemy sniper and artillery fire. Larson, then a T/3, left his shelter during action on May 21 at Charpat, and with the assistance of another man, moved a wounded soldier to a place of safety. He later administered first aid to the rescued soldier. Word comes to this soft and settled PRO wallah that he is to traverse the Stilwell Road from Ledo to Kunming. Let it settle for a while, then spin the wheels as fast as possible, thus miring yourself in deeper. This gives you a much needed rest or a chance to catch up on your Army Institute Correspondence Course. Neglect to bring a fire extinguisher because if the jeep catches fire you will have a chance to use your native ingenuity to put it out. In China, before every sharp curve there is a traffic sign with nothing but a bugle on it. You will naturally ignore it thinking that it is an advertisement for a local "jive" band, or maybe somebody just liked to draw bugles. After being battered six or seven times by vehicles coming in the opposite direction you will suddenly realize that it is not a bugle but a horn and that you are supposed to blow yours. On the road you will undoubtedly hear all sorts of characters. One of the most prominent is a fellow who fought in the Salween Campaign with the Chinese. Whenever even slightly alcoholic he would go around shouting, "Stop them! Stop them! The P=47's are eating up all the grass!" When last heard of he was going to OCS. If when rounding a curve on a steep grade the jeep continues to go in a straight line, and you suddenly find yourself "over, over here," remember that "Silence Would Have Meant Security." Keeping your self-confidence and composure, carefully pack vehicle in your boy scout utility bag and turn it in for salvage at the nearest supply room. KUNMING - (ANS) - Three Chinese officers were executed by a firing squad here this week for theft and extortion in handling of military supplies for the Chinese armies. In a firm move to prevent the recurrence of the old Burma Road squeeze that throttled the movement of supplies to stricken armies, Chiang Kai-shek approved the decision of the five-man military tribunal and personally ordered the death sentences. APO 689 - In the laying of the military pipeline in China, Burma and India, a number of preliminary steps had to be first undertaken before actual construction got underway. Foremost among these was the going out and getting the lay of the land, and if found to be any good, the party sent forth to secure same reported back to his immediate superior by first indorsement. Too much emphasis cannot be placed on this important phase of pipelining, especially when the line reached China, where they got an entirely new slant on things! It must be borne in mind, of course, that these opening remarks are purely for the benefit of the layman. At the various stockpiles where pipe was found to be so round . . . so smooth so firmly stacked . . . a group known as "swaboteurs" worked, swabbing out each individual joint. Caution was exercised to rid the pipe of empty or near-empty gin bottles. The procedure in such circumstances was thus: contents below "3-fingers" were retained by the finder; in excess of that amount, it was turned over to an immediate superior for disposition. 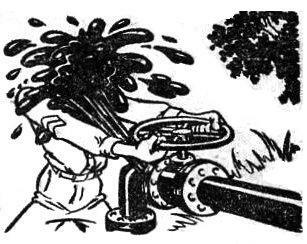 Thus far we have attempted to orient the reader merely with a generalized picture of the problems encountered in the construction and operation of a military pipeline system. Suppose we briefly trace this important project from its inception. An aspiring young engineer from one of the major oil companies back in Shangri La (and who prefers to remain anonymous for safety's sake) first conceived the possibilities of a military pipeline, later to become facetiously known as a "portable military pipeline system," details of which were shrouded in military secrecy. Although the blanket of secrecy has been somewhat lifted in past months, the mystery still remains as to why the word "portable" was appended to the title. Ask the man who owns one . . . it possesses the same degree of portability as the Washington Monument. Having touched briefly on the subjects of topography, surveying and the equipment itself, we proceed to another important stage of pipelining - the ditch in which the line is laid. As a brief aside, there is a legend about the Commanding Officer of a pipeline company who asked for a "ditching detail" and 30 men promptly volunteered, under the impression he was asking for a "bitching detail." dug as conveniently close to the line as was possible. The digging of this ditch naturally resulted in great quantities of loose dirt being left piled about in various places. To eliminate this, auxiliary holes were dug at regular intervals and the dirt accumulating from the pipeline ditch was deposited in those holes and covered over. Thus the ditch was dug and the sundry joints of pipe strung alongside and coupled. 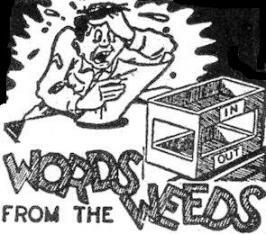 Before being placed therein, counsel was sought as a to the proper time to "plant the line," so to speak. A maze of pamphlets, engineering books and technical manuals were consulted and in the final analysis it was the old reliable and ever-dependable Farmer's Almanac that was the final and determining authority, stating, in part, that only in the dark of the moon and when the frost is on the couplin' should pipelines be planted. With this weighty problem disposed of, actual lowering of the pipe could proceed. The next step remaining was the placing of the pipe in the ditch, preparatory to testing and ultimate operation. In each instance a last minute check was always made to make certain workmen still remained in the ditch (especially first three graders), thus running the risk of having the heavy joints of the coupled line placed atop them (we lost more men that way in the early days of the pipeline). At long last came the initial testing of the first section of line. Water was placed in the line for pumping. After a reasonable time the fluid arrived at its destination and when no leaks were discovered, the line foreman immediately knew something was wrong! Having profited by their earlier mistakes, the construction crews were, by March 1944, really making strides forward in the laying of the line... in fact they were going like a bat out of Hellgate! And even in the mountains where the problem of line suspensions arose, this too they took in stride, once they got the hang of things. However, let no one get the mistaken impression that after the first few months of construction that the remainder of the project was a pushover. There were always the ever-present mosquitoes, constantly sticking the men for the "drinks"; leeches that were harder to get rid of then a process server, and boa constrictors to harass the constructors. One pipeline company however, boasted an old oilfield roustabout from Oklahoma who would engage the snakes in battle and spot them the first bite! On another occasion a jeep was wending its way along the Ledo Road where it winds in and out among the precipitous mountains when a GI suddenly dropped from above, right in front of the jeep. Picking himself up, he mumbled something about it having been the third time that morning he had fallen out of the pipeline right-of-way while walking line. As one hardened pipeliner so aptly summed up the country: "It ain't the Rising Sun that worries us as much as that damn noonday sun!" Streams and rivers swollen by monsoon rains, together with near impassable roads served also to greatly hamper progress of the line. It was not uncommon for line couplers and welders, working days on end in waist-deep water, to become stricken with floating kidneys. It became necessary at the peak of last year's monsoon rains, to issue diving suits to line walkers. One ingenious Company Commander trained an octopus for line maintenance work on those sections of the line which become inundated during the heavy rains. The less said about the roadways during the monsoon the better. For the most part they resembled a detour to a detour. The greater portion of the road problems will be eliminated this year, however, as Engineer troops are at work making these roads navigable during the monsoon season. Amphibious pants and shoes are also being issued to all pipeline troops to help in combating the torrential rains. With all its heartaches and back breaks, however, the laying of the line was not without its humorous sides. In one instance, a construction crew, engaged in laying line over a fog-enshrouded mountain, found to their utter amazement, after the fog had lifted, that they had strung and coupled a quarter of a mile of line right out into thin air! On another occasion, a maintenance crew, after repairing a line break in mid-stream, decided to stick a five rupee note in the line and check its arrival at the next downstream pump station. Fifteen minutes later the station operator acknowledged receipt of a catfish and two rupees change! Playing no small part in both the construction and operation of the line has been the job of supply. Whenever additional or replacement equipment was needed, all that was required was to prepare a requisition, secure two (reputable) co-signers and leave the Company Commander as collateral. Upon delivery of the material, if everything balanced out, the Company Commander was released from the dungeon to return to his Company duties. The guiding hand behind this gigantic undertaking has, of course, been the Pipeline Office, which has managed thus far to survive four official titles - to say nothing of the "unofficial" ones. Here the project was "built on paper" before being laid to rest in CBI's terra firma. They saw to it that there was a check, check here, a check, check there, here a check, there a check, everywhere a check-valve, if need be. And if somewhere along the line when they pressed the middle valve down, if the fluid didn't go 'round-and-round, something else did, and it wasn't fluid! Because of its large staff of officers, Pipeline Office has become (slyly) known as "The Brass Foundry." 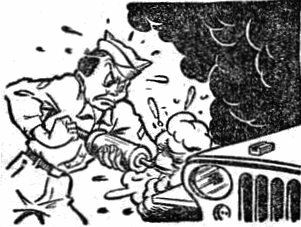 A "visiting fireman" from Delhi swears an oath that during a recent visit, he stopped by to pay his respects and when he opened the door, three second lieutenants fell out onto the walkway! It would be both difficult and unfair to single out any star performers among the pipeline troops, nor are they seeking any self-glorification, being content to await the awarding of the coveted Coupling Cluster. In the meantime, then can justifiably rest on their laurels and or shovels. Perhaps the best compliment thus far paid them for their efforts came on that momentous day when the various pipeline products reached China. A Chinese dignitary, present for the auspicious occasion, looked proudly over the white gasoline, the green aviation gasoline, and the brown diesel oil, then said: "Sirs, you are not only delivering to China these all-vital and highly precious petroleum products, you are bringing them to us in Technicolor!" Sgt. 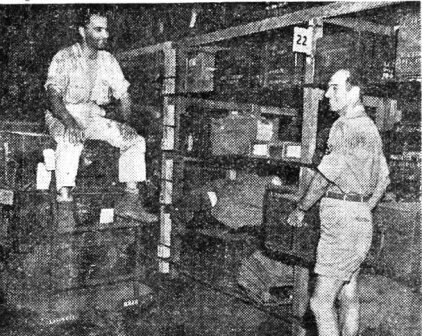 Fouad El-Khouri of Gridley park, Pa., and T/5 Ralph M. North of Hollis, N.Y., check through the personal luggage of officers and men in the baggage section of a warehouse of the Base General Depot in Calcutta. More than 4,000 trunks, barracks bags, suitcases and other luggage are shipped to personnel in the India-Burma or China Theaters or sent back to the States for the Army personnel. CALCUTTA - "Where's my baggage?" is the cry that haunts Lt. Joseph T. Lytle of Pittsburgh, Pa., personal effects officer for the Base Section of the India-Burma Theater, which means that he is hunting baggage for almost every officer and enlisted man in the I-B and China Theaters. Probably 50 percent of the officers and enlisted men in the Theater have a personal baggage problem or have heard some wild tale about how long it took "to get my footlocker over here." In the warehouse of Base General Depot in Calcutta, which handles the majority of personal baggage problems for the Theater are hundreds of footlockers, barracks bags and other luggage awaiting shipment home, to some base or awaiting someone to claim it. Approximately 2,500 pieces of baggage is received each month and nearly that same amount is shipped to forward bases or home for soldiers, said Lytle. Once an enlisted man's or officer's luggage gets to a POE, it gets out of there fast to the I-B Theater. Many of the lengthy-wait tales are due to shipment of the baggage from a stateside camp to the POE and then the overseas theater, said Lytle. Baggage, once received in Calcutta, is catalogued and shipped out to the individual as soon as possible. Officers and EM not located on the locator system get their baggage held for a reasonable period before the personal effects section sends it back to the States. And a reasonable period is about three or four months. If and when Lytle and his two warehouse men, Sgt. Faoud El-Khouri of Gridley Park, Pa., and Cpl. Ralph M. North of Hollis, N.Y., do any traveling, they will probably do it with a toothbrush and an extra handkerchief. They don't want to see another footlocker or barracks bag in many a moon. The India-Burma Army Exchange Service is going out of the curio business. And out of deference to the Servicemen in the Theater, prices of embroidered hand bags, brocade table runners and CBI-figured velvet pillow tops are being slashed to less than half the original price, or 50 percent of the actual value. According to Maj. Keith Kepley, Exchange Service chief, the Theater Exchange Council had a choice of selling the remaining curios to other Theaters without a loss, or retaining them for disposal to I-B men. The latter course was decided upon, and 15,000 hand bags, formerly selling at from 145 to 25 rupees apiece, will now be sold at 40-25-10 rupees. Twenty thousand table runners and a number of pillow tops will be sold for from 25 to five rupees. One of the reasons for the unprecedented cut in prices, according to Kepley, is the turning over of the sale of all curios in the Theater's 310 exchanges to local concessionaires. It is the desire of the exchange authorities to establish a low price in the minds of the soldier-buyers on all curio items, thus making an attempt to preclude the usual rough shuffle for the buyer when dealing with the Indian merchants. The Exchange Service plans to reach all remote units with the sale by use of the mobile PX, now in the Eastern area. KISS AND MAKE UP Movie starlet Claire James, runner-up in the 1938 Miss America contest, who reported reconciliation with second husband Ray Dorsey, New York advertising executive. BURMA - Though there hasn't been a Jap plane over northern Burma in a long time, members of Second Army Troop Carrier squadron are still getting good service from their slit-trenches. It seems that the trees, which surround the outfit's area, have developed a nasty habit of falling down, for no apparent reason, at odd moments. Equipped with a built-in alarm system, the trees give out with nerve-shattering groans of varying lengths just before toppling over. This is the signal for immediate evasive action and seasoned soldiers hit the dirt without waiting for a red alert. At first the outfit suspected this jungle attack to be the new "secret weapon" promised by Tokyo Rose. But the brass hats discovered more scientific explanation. The jungle trees, suffering cold, heat, monsoons, and dry spells - even as you and I - eventually catch their death of pneumonia or some similar tree disease. Comes a little breeze, and down comes the tree. After several hundred foot trees had suddenly dropped on the area at odd moments, Lt. Herbert M. Lineburger, Dallas, N.C., organized a band of axe-men to seek out and fell all the likely candidates in the area. The narrowest escape to date occurred when one giant tree fell squarely across the tent occupied by Sgt. Leon H. Pilotte, Fowler, Ind. ; Cpl. Maurice H. Johnson, Flat River, Mo. ; Cpl. Herbert Levine, Bronx, N.Y., and Cpl. Melvin M. Rabinowitz, Hartford, Conn. Though the tent was completely demolished, along with two charpoys and a stateside radio, no casualties were inflicted. The men were attending a picture, "Saratoga Trunk" at the time. CALCUTTA, INDIA - The world's record for the fastest unloading of a Liberty ship, held by this Base Section of the India-Burma Theater, was again lowered last month by a port battalion, which completely discharged a heavily ladened ship in 44 hours, 5 minutes. The new record time bettered the mark set in February of this year by 25 minutes. As with the previous mark, no special plans, added equipment or additional personnel was used and the record was set in a normal, routine operation. During May, three other Base Section records were set. Rail tonnage shipped from Calcutta showed an increase of 24,817 long tons over the previous mark set in April, and the April mark for vehicles shipped was also bettered. WHAT A CHASSIS! 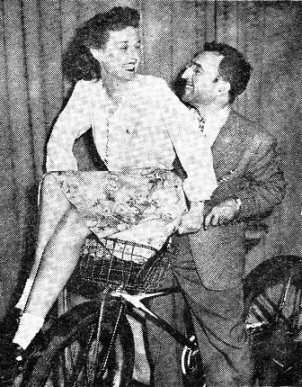 Jose Sanchez, Spanish professor at Northwestern University, rides co-ed to school on his bike after the comely miss had bought $400 in War Bonds. The Slipstream, published in Agra, tells the story of S/Sgt. Paul R. Sherwood, seated in a C-46 warming up for takeoff to Kashmir, where Sherwood was scheduled for a 14-day furlough. Suddenly, the pilot poked his head out of his compartment and called, "Is Sgt. Sherwood here?" He was. "Sergeant," said the pilot, "the tower just called and wants to know whether you'd like to go home to the States or go ahead with your Kashmir trip?" The answer came precipitously, "Lemme outa here," screamed Sherwood. * * * * * * * * The reasons are three that Roundups reach the brambles shortly after they are printed Thursday mornings in Calcutta. They are T/4's Jack Grimm, Tony Crocco and T/5 Tony Perez. An example of their industry is the V-E Day edition. With twice the usual number of copies rolling off the presses of The Statesman, each was counted by hand, tossed into the correct mailbag and, four hours later, the last paper was on ATC's air-freight docks ready to be flown to its destination. * * * * * * * * Cpl. Ray Lowery writes us that after spending many weary months in Assam, Cpl. Robert Good, a Signal linesman of an ASC group, decided to finish his interrupted high school studies by correspondence. Good wrote to his high school in Detroit, received an answer from the principal that he had been credited with 45 hours - 20 for a year's service and 25 for his Army schooling - and he had now been recommended for graduation. The ol' sheepskin is expected shortly. * * * * * * * * From the Roundup's special pipeline to the Adjutant General's Office, we have learned from Col. Frank Milani the fate of the proposed Ledo Road shoulder patch. Bluntly, chums, is has been disapproved by the War Department. Which reminds us of the precious nickname recently pinned upon Maj. Gen. Lewis A. Pick, peripatetic leader of The Road project - "Old Mud and Ruts." * * * * * * * * One of Roundup's staffers must have taken the Editor too literally last week when Ye Ed, brooding over a sheaf of dull copy, snapped out with a "let's corn it up a bit, fellows." Hewing to the line, this hack wrote that a helicopter soared "over the maize of the Burma jungle." * * * * * * * * No ordinary burro is "Clara Belle," pride of the 1304th Base Unit. "Clara Belle" starts her day with a fluffy omelette and a cup of black coffee, served by the still sleepy-eyed PX-wallahs. At noon, this bodacious beast sometimes nuzzles a coca-cola. As evening approaches, "Clara Belle" ambles slowly to the Post Theater, where a lush bit of green grass is reserved for her. At the close of the show, she pushes and shoves her way to the road and disappears into the night - to return with the opening of the PX in the morning. Occasionally, a playful G.I. entices "Clara Belle" into a sip of beer, and only then is the exemplary burro guilty of un-ladylike behavior. * * * * * * * * When Cook Sgt. Cearn Julian was observed generously putting an extra muffin on an EM's plate recently at 1328th AAFBU, Assam, the next man in line asked for the same treatment. Julian explained courteously: "I gave that fellow an extra one because I dropped the first one in his gravy and I wanted him to have a decent dessert." CHUNGKING - The far-ranging 14th Air Force of Maj. Gen. Claire L. Chennault continued its sweeping disruption of Japanese transportation and communication in China this week. Fighters, in one day's missions, flew over more than 2,000 miles from Paotou, north of the Yellow River in Suiyuan Province, to French Indo-China. They damaged more than 30 enemy locomotives and hit bridges, railroad installations and rolling stock. No air opposition was encountered, but anti-aircraft fire was heavy in some locations. 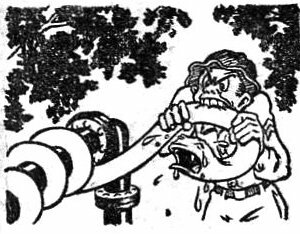 In central China, fighters maintained pressure on Jap rail and water communications south of Hankow. River shipping in the Tungling Lake sector was also hit. P-51's attacked the former American air bases at Kweilin and at Kweiyang, while other fighters bombed a power plant north of Haiphong. RANGOON - The slowly enlarging ring of Allied-held Burma above Rangoon expanded toward the Thailand border this week with British Army troops more than 20 miles beyond Toungoo on the Toungoo-Mawchi Road. Gurkha troops, supported by tanks and artillery, are leading the slow push eastward and are about 50 miles from the Thailand border according to the Southeast Asia Command. There are thousands of us two years in Assam and Burma with not nearly enough points for demobilization; rotation thrown completely out. We all have families, wives, children or sweethearts who contemplate our return. We realize we aren't eligible for discharge, but we feel we should be entitled to a furlough in the States. Is that asking too much? For the Roundup to state we'd be little affected in the sharp change in Theater policy is erroneous. If we aren't, as you stated, will you please be more clear and concise on what the present overseas policy is for men who have attained two years over here and still do not come close to the point system in the Readjustment Plan? Certainly, that ambiguous expression "will be little affected" is quite insufficient. Believe me, hundreds of us here and thousands of us elsewhere in this Theater are awaiting your answer. (Editor's note: - The War Department announced suspension of rotation on V-E Day. To date, no word has been received from Washington on possible reinstitution of rotation. Theater Headquarters has no information which has not been made available to you. Recently, this Theater authorized 45-day Temporary Duty in the States for enlisted men and officers designated as "key personnel" who have served 24 consecutive months overseas. At the beginning, this allotment will be small. When and if the number will be increased will be determined by available shipping space. AGRA - S/Sgt. 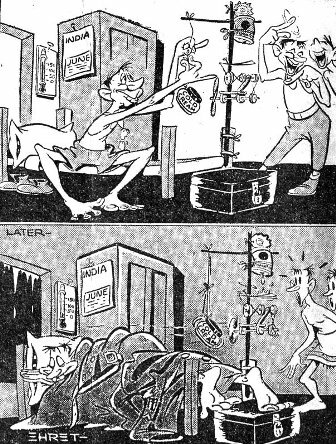 Erwin Perry is convinced that malarial precautions are the duty of every man but he wishes the Indian goats would appreciate the orientation necessary to get a G.I. mosquito conscious. One recent night Perry had bedded down comfortably and carefully tucked in his mosquito net. Just as he had been wafted into dreamland he felt something resting on his chest and sleepily looked up. The something was the four hooves of a goat, which was an old base pet. The goat had eaten his way right through Perry's mosquito net. BURMA - This is Burma, on the Stilwell Road. It rained last night and a G.I. drowsy from saku and Spam fell to slumber in a basha just a few feet off the 82-mile mark. The high altitude and the rice wine were conducive to sleep, and soon his snores were blended into the background of the roaring convoy and the pouring rain and the barking deer. So it was that this 23-month-in-Burma Engineer dreamed a dream that may make history. It is June of 1965. The war has long been over and a former corporal has, under the provisions of the G.I. 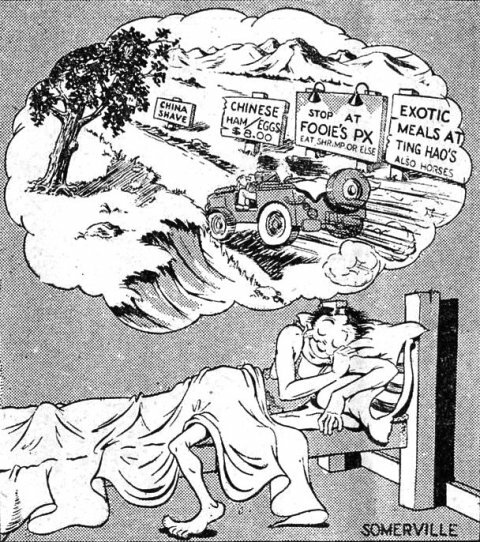 Bill of Rights and the Surplus Property Bill, bought the Ledo Road and launched a high-pressure campaign selling rich Americans on the prospect of spending their vacations in the Orient by driving a jeep all the way from Calcutta to Kunming over the famous Stilwell Road. Every spring, thousands of millionaire sportsmen arrive in exciting Calcutta via the Mariposa and rent jeeps from Babu Jesse Sincere's Chowringhee Motor Market. The 30-day rental of the jeep is $999.50. Of the thousands of sportsmen and explorers who make the annual trip, many are honeymooners who are thrilled by their ferry ride up the Brahmaputra and who stop at Chabua to send gift parcels of savory Assam tea direct from the tea planters to friends and relatives back in the States. At Ledo, they spend two days at the Hotel de la Ravdin and dine on roast peacock as served by the Maitre d'Hotel Walton. A one-day stop near Loglai affords the vacationer an opportunity to fish in Thursday River (dynamite is available at any Naga village). Excited tourists get their first taste of exotic Chinese cooking at the Golden Dragon at Chinglo, near Shingbwiyang. And, of course, while at Shing everyone visits the world's most famous privy. The original was built in 1944 for a famous movie star. Now a granite replica of the original bamboo Chic Sale has been erected by students of that Philadelphia high school which selected her as the woman who had done the most for soldiers' morale. A large bronze plaque reads "Ann Sheridan Sat Here." At Warazup, for an extra hundred bucks, one can make a side trip down the old Combat Trail to Sgt. Ben Franklin's jade mines. Ben runs this branch from Ft. Worth, Texas, of course. At Myitkyina, you can easily spend two days walking through the old battlegrounds. For 10 rupees, the Kachins will sell you an exact replica of Uncle Joe Stilwell's hat or for 50 rupees a hand-carved Pick's stick. There is still swimming at Lawson Beach along the Irrawaddy on Sunday afternoons. At Bhamo, you can have your picture painted against the background of the famous bazaars by the Hermit of the Road, Milford Zornes, the mystery man of the road. There are those who say that Zornes once was a successful American artist who went mad in the Service and refused to leave Burma. Many of the ailing Yanks stop at Seagrave's Super Clinic in Namhkam. So goes the safari to China via the most famous highway in the world. Twenty-eight days of adventure from India to China. Drink ice-cold Coke fresh from the Pipeline, which is now operated by the Coca Co. Stop at any deserted PX along The Road and drink that wonderful Hyde Park beer. An enormous quantity of this malt was left here when the soldiers pulled out of Burma. No one has ever been able to determine why. As the adventurers enter China and make their way down to the Salween George, the skeleton remains of darned-up 6x6 trucks can be seen where Chinese drivers forgot what they learned at the Ledo Truck Drivers' School. A quick stop at Kunming for American ham and eggs and then on to Chungking, once the wartime capital of China - now just a ghost town since the re-establishment of the Nanking capital. Oh, yes, at Kunming play ping-pong on the very same table that "Buck" used. Such is a summer vacation in the Far East in 1965. Special announcement: All ex-Servicemen who worked on the road during the war will be permitted to make this vacation tour absolutely free of charge. The Roundup is a weekly newspaper of the United States Forces, published by and for the men in Burma and India, from news and pictures supplied by staff members, soldier correspondents, Army News Service and United Press. The Roundup is published Thursday of each week and is printed by The Statesman in New Delhi and Calcutta, India. Editorial matter should be sent directly to Capt. Floyd Walter, Hq., U.S.F., I.B.T., APO 885, New York, N.Y. and should arrive not later than Saturday in order to be included in that week's issue. Pictures must arrive by Friday and must be negatives or enlargements. Stories should contain full name and organization of sender. Complaints about circulation should be sent directly to Lt. Drexel Nixon, Hq., U.S.F., I.B.T., APO 885, New York, N.Y. Units on the mailing list should make notification of any major change in personnel strength or any change of APO.